Five ways to keep stone surfaces looking their best. Marble, granite, terrazzo and travertine are just a few of the popular natural stones that can enhance your kitchen or bathroom. The problem is that even with proper care, over time these stones may crack, lose their shine, or develop mold in the grout. Natural stones, especially soft stones such as marble, are riddled with spongelike capillaries that absorb liquids. The proper sealant can go a long way in protecting countertops from acidic spills – for example, lemon juice, tomato sauce or bleach cleanser – that can lead to discoloration. 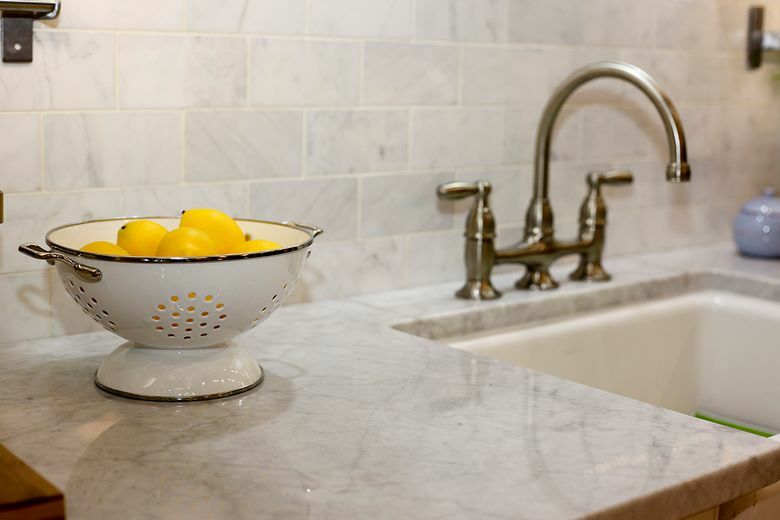 Soft stones, such as Carrara and Calcutta marbles, are easily etched with daily use. One preventive measure for these fine surface lines is taking down the highly reflective shine of new marble to a “honed” finish so that scratches are hardly noticeable. A honed, or matte, finish is smooth without being reflective and the colors are more muted. Over time, the epoxy used in the seams of countertop slabs of stone will degenerate. The seams will become visible, appearing as cracks in the surface. Repairing seams is a matter of digging out the old epoxy and replacing it with epoxy that’s color-matched to your stone. The same process is used for chipping and deep scratches, eliminating the need to replace the entire slab of stone. Over time, grout will get compromised around a kitchen or bathroom sink or a shower floor. Poor-quality sealant and grouting may quicken this process. The first signs of compromised grout is cracking and chipping. Sometimes you’ll see black or green mold, but it may be invisibly destroying your walls. A professional cleaning system will pressure wash the grout and tile, and vacuum out the debris through a hose leading outside. After removing the old grout, the area is dried and the grout is replaced, and then the tile is resealed. Oil is the most common cause of staining that seeps into the stone and can’t simply be polished out. “It’s virtually unavoidable that your granite kitchen countertops and backsplash over the stove will be splattered with cooking grease,” Vallellanes says. Professional cleaning involves applying a poultice that pulls out the oil, and then the surface is resealed. Natural stone is popular for good reasons: it’s beautiful, luxurious and, in most cases, durable. With all of the restoration options available, the only time to replace natural stone is when you want to – not because you need to. If you need stone cleaning and sealing, tile or grout services, or surface restoration, Seal Team One is here to offer you quality service. We are a small company, so you can trust that you will receive personal service. We offer our customers free estimates, without obligation.